Active iPhone owners—ones who work their iPhones hard all day—face a choice: They can use their phones with abandon, knowing they risk running out of power; they can recharge the phone at some point during the day; or they can opt for a battery of some sort. I don’t like the stress of battery-level watching, and I don’t want to carry a USB-to-Lightning-connector cable around with me (and be dependent on a USB port or charger), so I opt for a battery. Specifically, I prefer an iPhone case that includes a built-in battery. 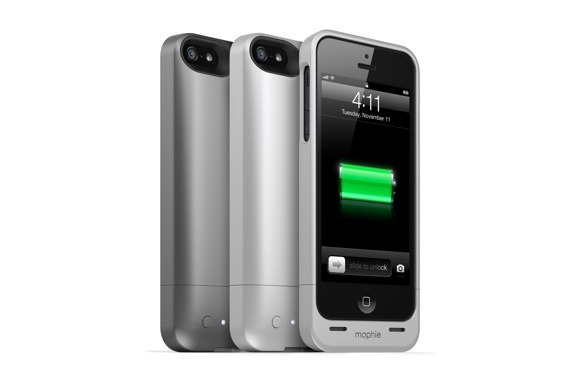 I reviewed several Mophie battery cases for the iPhone 4 and 4S. I loved the Mophie Juice Pack Plus (4.5 out of 5 rating), liked the Juice Pack Air (3.5 out of 5), and liked the rugged Juice Pack Pro (3.5 out of 5). So I was eager to get my hands on Mophie’s first battery case for the iPhone 5, the $80 Juice Pack Helium. My friend and colleague Dan Frakes gave us a first look at the Helium; here's my full review. The Helium packs 1500 milliamp hours (mAh), which matches the capacity of the Juice Pack Air. In practical terms, this means that the Helium can’t fully charge an iPhone 5’s battery from empty, but in my testing the Helium can get awfully close: If my iPhone displays the (too-familiar) 10-percent battery warning, the Juice Pack Helium can push the phone’s battery back up to over 90 percent charged. Mophie says to expect an additional six hours of 3G or LTE use for calls and data, or up to seven hours of additional Wi-Fi usage. The company also says it takes two to three hours to fully charge the Helium’s battery, and that matched with my experience. Mophie praises the case’s slimness: The case measures 2.49 inches wide, 5.49 inches tall, and 0.59 inches thick. Though the case is indeed thinner than previous Mophie battery cases, that advantage is mostly attributable to the iPhone 5’s own slimmer profile. The case of course adds heft and weight to the iPhone 5, but not uncomfortably so. The Helium ships in two colors: dark metallic (a charcoal hue) and silver metallic (a light, not-quite-white color). I reviewed the dark metallic option, which looks sharp and has a smooth, comfortable-to-grip feel. Like all of Mophie’s cases, the Helium is actually two separate pieces. But where Mophie’s cases in the 30-pin-dock-connector era consisted of a small cap and a long body, that’s changed in the brave new Lightning-connector world. In the Helium, the base—the part that actually plugs into the iPhone 5’s Lightning port—is the small part. It contains two tiny pins that fit easily into the larger remaining portion of the case; the two parts of the case must be connected to charge the Helium (and your iPhone). Just like the Air, the Helium employs cutouts around the iPhone 5’s main controls: the volume buttons, the Ring/Silent switch, and the Sleep/Wake button. I continue to prefer cases (such as Mophie’s own Juice Pack Plus) that employ button overlays. As with other cases that employ cutouts like the Helium, I find that the necessary recessed positions of the actual controls makes them more difficult, and less comfortable, to use. That’s not to say it’s difficult or painful to access the controls on a Helium-clad iPhone 5; rather, it’s just less elegant than it could be. The base of the Helium sports a Micro-USB port for charging. (A USB cable is included with the case.) You can charge your iPhone in the case, or charge the two devices separately. I found that when I charged my iPhone with the Helium, the case grew surprisingly warm. It wasn’t too hot, but it was warm enough to get a little bothersome in my pocket and warmer than with Mophie’s previous JuicePack models. A company representative told me that this is because the Helium charges the iPhone at 1A—compared to 500mA for older models—so it produces more heat. As Dan noted in his first look at the Helium, the iPhone’s headphone jack is deeply recessed with the Helium on—much more than it is with the company’s prior cases. That half-inch depth means that only narrow headphone plugs—the one on Apple’s EarPods fortunately among them—will fit. Because of that, Mophie includes a three-inch headphone extender in the box. If you regularly use headphones that require the adapter, you’ll need to decide whether the tradeoff of needing to essentially keep that adapter attached to your headphone cord at all times is worth the benefits of using the case. I use headphones rarely enough that I instead just pop off the case as needed, rather than try to remember the adapter. When you’re using the iPhone’s built-in speaker, front-facing openings in the Helium case provide the slightest of volume boosts; these openings effectively cup the speakers to direct the sound towards you.